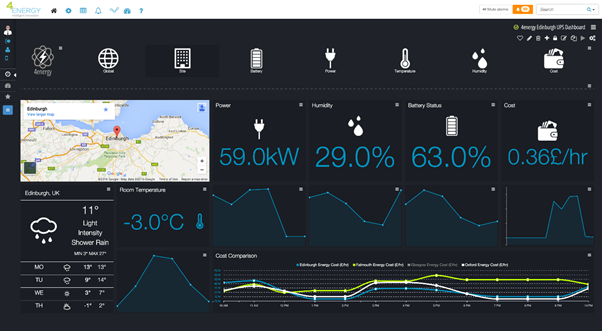 Data centres using SMARTset software are saving 15-20 % on their energy bills, according to recent results released by 4NG. The results were taken from a 3 hall, 30,000 ft2 data centre with average heat loads of 200 kW per room, where SMARTset was used to optimise airflow, reinforce thermal compliance and maximise capacity, while reducing the energy expenditure. The reduction in cooling power resulted in annual savings of more than £78,500. Energy usage was reduced by 785,000 kWh/year, with CO2 emissions cut by more than 410 tonnes/year. To achieve the energy bill savings, SMARTset was installed in the data centre to provide detailed thermal monitoring across the three halls and cooling infrastructure. Data centre staff then used SMARTset’s graphical displays, including heatmaps, to assess the thermal environment and quickly identify hot and cold spots in the rooms. Using this information, they planned the repositioning of air vents for balancing air flow. By using SMARTset’s optimisation feature, they were able to simulate the changes and proactively test and select the most beneficial vents layout. Once the vents had been moved, the positive impact of the changes were captured and validated via the “snapshot” feature of the optimisation module. Savings were made by changing the set points of CRAC units and chillers – a decision that could be made due to the improved air flow and safely implemented thanks to the constant monitoring of the room thermal behaviour. Finally, some CRACs were identified as now unnecessary, as they were counteracting each other by recirculating hot air. These ‘excess capacity’ CRACs were set as idle units on backup.